Recently tens of thousands of hip implants have been recalled due to defective parts that have contributed to chronic pain, metal poisoning and additional surgeries. Hip replacement surgery is supposed to help ease the pain of chronic hip and joint discomfort. Many with hip problems suffered through pain that kept them up at night and/or limited their everyday activities such as walking, exercising or shopping. Enduring even more pain and having to undergo additional surgeries because defective parts were used causes a lot of stress and strife for the patient and their entire family. Pain and suffering due to a company’s negligence should not be tolerated. Currently there are thousands of lawsuits pending regarding defective hip implants and specific devices. Metal-on-Polyethylene: The ball is made of metal and the socket is made of plastic (polyethylene) or has a plastic lining. Ceramic-on-Polyethylene: The ball is made of ceramic and the socket is made of plastic (polyethylene) or has a plastic lining. Metal-on-Metal: The ball and socket are both made of metal. Ceramic-on-Ceramic: The ball is made of ceramic and the socket has a ceramic lining. Ceramic-on-Metal: The ball is made of ceramic and the socket has a metal lining. The exact type of hip replacement device a patient receives is up to their orthopedic surgeon. After a careful evaluation, the surgeon will determine which device is best for the patient’s individual needs, taking into consideration the patient’s health, age, weight, height and other risk factors. Although there are risks with every surgery, and no device is 100 percent safe for all patients, all the time, some hip devices have been plagued with defects more often than others. The most commonly recalled devices are those involving metal-on-metal. Some of these hip devices were made from a cobalt-and-chromium alloy. In these cases, patients and health care professionals have claimed that debris from the metal ball sliding against the metal cup has caused tissue damage around the joint and has also caused harmful amounts of metallic debris to enter the bloodstream. Many of the lawsuits report that the products were defectively designed and the manufacturers did not properly inform physicians of the product’s risks. Additionally, reports suggest that patients implanted with metal-on-metal hips were more likely to require additional surgery within five years of implantation of the all-metal device. According to the Canadian Institutes for Health, patients with metal-on-metal implants face a 5.9 percent increased likelihood of having to undergo additional surgery to replace the device within five years of original implantation, in comparison to a 2.7 percent rate among people who received metal-on-plastic implants. The FDA also came out with new guidelines for patients implanted with all-metal devices -- advising regular physical examinations, diagnostic imaging, and metal ion testing be done on patients who think they may have received defective hip implants. Contact your physician immediately if you have had hip surgery and are still in pain. The following are recalls specific to metal-on-metal hip implants: Smith & Nephew R3 Metal Liners of the R3 Acetabular System, DePuy ASR TM XL Acetabular System, and Zimmer Durom Acetabular Component. For more information on medical device recalls, see the FDA’s list. If your hip implant is on the recall list or if you suspect a hip implant device may be defective, contact a knowledgeable Miami defective hip implant attorney. Call Friedman, Rodman and Frank. We have nearly 100 years of combined experienced advocating for those who have been injured by the negligence of others. Let us bring our skill and experience to your case. 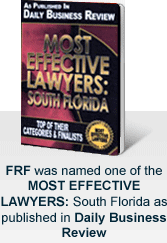 Call us at 305-448-8585 to schedule a free consultation.